Just about as soon as I finished singing the praises of hearty soups, another recipe idea popped into my head - this one was a stew. If soup is the perfect thing to warm you up on a chilly fall night, then there is simply no word to describe the ecstasies of stew. Like soup, but heartier, chunkier, and unabashed in its ability to showcase the variety of tastes and textures it contains. The stew we came up with tonight featured chicken, beans, and white yams - a variety I had never tried before, but which proved to be quite delicious. 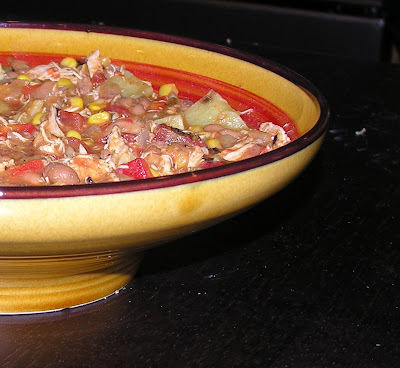 It was a Friday night of cooking and experimenting; we were working on a few new, more complicated recipes, and the stew was our quick and easy dinner. It also turned out to be the star of the evening, as it were. This recipe was inspired by a dish I had in Argentina, which consisted of brown lentils, stew meat, bacon, and batatas - a South American sweet potato varietal. Anyone who knows me well knows that this is not my typical dish. I'm not exactly a "bacon" kind of girl. So, while this dish was tasty enough to inspire this recipe, most will not be surprised to find that I use the term "inspire" quite loosely here. No bacon. Sorry. As it turns out, this dish is really not at all like the lentil stew I ate in South America, but it is indeed delicious. I used a host of canned ingredients, but if you are feeling inspired, you can do everything fresh (though it is largely unnecessary, in my opinion). I do maintain, however, that roasting the pepper and yam before adding them to the stew is essential; it provides a smoky, deep flavor that can't be achieved by sauteing. The most time-consuming step is boiling the chicken, which we did in a separate pot of water instead of in the stew base itself. I chose this method so that I could boil the chicken breast skin-on and bone-in, and so that I could shred the chicken before adding it to the stew. I prefer the texture of the shredded chicken to big chunks of chicken, and I think it makes for moister, more tender meat. The added bonus, of course, is the big Tupperware of homemade chicken soup now sitting in the freezer; instead of a lonely chicken-only boil, we added some carrots, parsnips, celery, onion, and parsley to the water. We also added a few cupfuls of this stock to the stew, which gave it a lovely rich flavor. seasonings to taste: salt, pepper, cumin, adobo, chili powder, etc. Chop the chicken breast in half, leaving skin on and bones in. Boil in salted, seasoned water until cooked through, about 20 min. Remove from pot (reserve cooking liquid), remove the skin, and shred off the bone with a fork. Meanwhile, roast the yam and the red pepper. Peel and dice the yam (1/2 in. dice). In a foil-lined roasting pan, toss with olive oil, salt, pepper, chili powder, and cumin. Roast in the oven for half an hour or so, until the yam is golden and tender. Roast the pepper over the flame of a gas burner, or under a broiler until skin is charred. Let cool, peel off the charred skin, and dice the now naked pepper. Now start the stew: heat olive oil in a heavy saucepan, then add onions and garlic. Saute until softened. Add tomatoes, beans, corn, and green chilies. Bring almost to a boil, and then add chicken, diced pepper, and roasted sweet potatoes. Add chicken stock as necessary so that there is enough liquid to cover. Season stew. Cover pan and let simmer until everything is hot and flavors have blended, about 10-15 min. Serve in wide bowls with cornbread, rice, or tortillas. Yum. I'm totally going to try this. Thanks for not being a bacon girl. Will you bring some of this back to the room? It sounds amazing! I would, but I ate all of it. It took four consecutive dinners of the stuff, but it sure was tasty. Next time I make it I'll let you know!